The Arts and Education Council believes that a region rich with arts and cultural experiences is critical to creating and sustaining vibrant communities. That's why the Arts and Education Council strategically invests your donations in people, organizations and programs across the bi-state region that promote what we have identified as the Elements of a Vibrant Community. Or, the ability of the arts to inspire kids, energize communities, bridge cultural divides, foster the economy and enrich lives. There are a million stories to tell of adults and children in our community impacted by the arts in some way each year. And there are thousands of stories of The Makers - people creating and supporting art to make a positive change in our region. Below are examples of the impact your donation to the Arts and Education Council makes in our community. From enhancing academic achievement to bringing joy, your gift to the Arts and Education Council makes a difference in the lives of 1.6 million adults and children across our region each year. Explore stories about just some of the people your gift has reached. The Makers of St. Louis are the people whose creativity is inseparable from the identity of our city. St. Louis has a tangible passion for the arts, and The Makers series focuses on the people behind the performances, exhibitions and shows that shape the artistic spirit of our community. Watch the video that inspired the series here. Explore more about The Makers. Read or download the Arts and Education Council's most recent annual reports to the community to learn more about the impact your donation has in our region. The Arts and Education Council's financial statements and Form 990s detail how your donation was invested in the community. 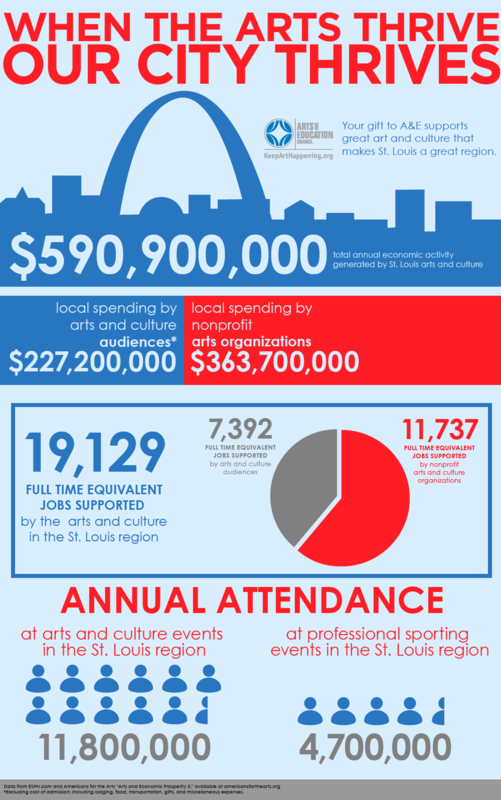 The St. Louis region is home to an exceptionally vibrant arts industry that generates $590 million in revenue for the local economy each year and supports 19,000 full-time jobs.